The Geckos here are bright green like the one on the TV. 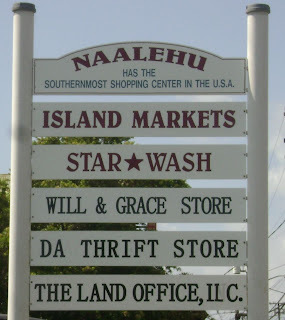 only to learn that it's just a store owned by a couple named Will & Grace. Before we got on the lava boat we were told to make a pit stop. 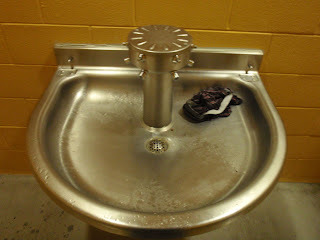 And the public restroom had a pair of underwear in the sink. This is especially gross because you know the guy tried to clean it. But then realized that it was no avail and abandoned it altogether. Looks like you're enjoying yourself over there! Reading this is like a nice form of escapism from 14-degree Boston. Walking around in the cold, I imagine myself hanging out at the volcanoes and it makes me feel better. Although I don't have rats in my dorm. Aren't those geckos awesome? Last March we stayed on Oahu, in a house (directly across the street from the Dillingham Airfield drop zone on Farrington Hwy) on the North Shore, and they were everywhere! My husband, who grew up in Hawaii Kai, had never seen them before (typically he'd only seen the brownish grey house geckos), and we did a little investigating. Apparently they are non-indigenous to the islands, and were introduced back in the 1970ish era. They are actually native to Madagascar. I spent most of my vacation following them around with my camera! :) They are so cute! alfred hitchcock would have loved the birds shot.. It's like OMG on the undies. I just about ralphed all over myself. Nice one Jorge. Loved the birds,did you have visions of all their relatives and the relatives of those relatives and so on and so on, showing up? Birds!!! Birds !! Too funny. Always thought I would like to visit the islands someday, but.. well... I don't think I want to beat off the BIRDS!!! for my breakfast.. LMAO. I love the Geckos! Have you ever seen one run on its hind legs? They look like little cartoon characters! He couldn't put it in the garbage can? been loving your updates from the Big I. My girlfriend lives in Volcano. I will be making my 4th trip to Hawaii in 3 years in a few days to see her and for my friends wedding. Your posts made me wish i was back there right now!